The Division 2 is a fantastic action-shooter that invites players to take their own approach to a beautifully ruined Washington D.C. The Division 2's campaign is full of great gunplay, loot, and missions. Only toward the end of my 60 hours of play did it start to suffer from a lack of interesting incentives, but the journey was enough fun that it made up for the destination. The Division 2 manages to improve upon the original formula in almost every way, but its tale and tone are frequently awful. Recent games have reminded me that sometimes great execution is better than a noble failure, and The Division 2 executes on its concept with finesse. The story is lackluster, and the real-world aesthetic will turn of some players, but it doesn't matter because the core and flow of this looter shooter is great. There are something things that could be tweaked, like enemy density and their ability to one-shot you, but overall The Division 2 is a sequel done right. Witnessing an entire squad full of players who are using completely different abilities in what is essentially a cover-based tactical shooter is quite the sight. It still has that semi-grindy feel, but it's engaging in the sense that the grind is never a chore. 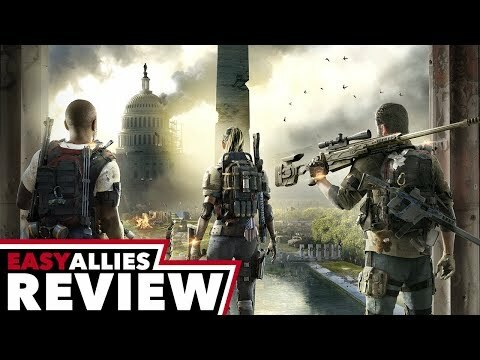 The Division 2 has way more content than the original, it is set in a bigger more varied city, and shows great balance in loot and character levelling. It is too conservative in gameplay and level design, but we still love its gunplay and cover system. Review in progress. This is a big win for Massive, Ubisoft and players themselves. Sure, The Division 2 isn’t perfect. Those hoping for an in-depth and engaging story will find themselves extremely disappointed in the meager offering on hand here. But, if you can overlook that, you’ll find an amazing experience beneath that is just teeming with engaging content. The Division 2 does not suppose any massive revolution in its formula, nor pretends to be it, given the good taste of mouth that the first one left. It more than meets the "more and better" expected of a sequel.